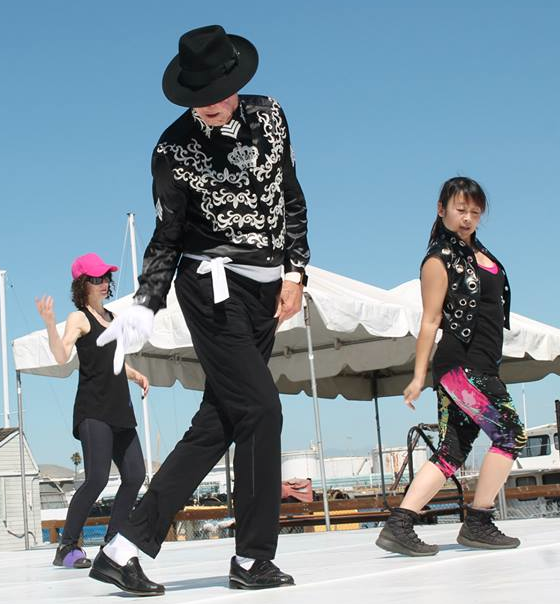 Dancing in the sunshine of the San Pedro Ports o’ Call Village offers a dance experience that many can enjoy. This Festival of the Arts is produced for the benefit of the community with free dance, music and art events free to passersby. The dance portion was produced by long standing dance concert producer and choreographer Louise Reichlin. 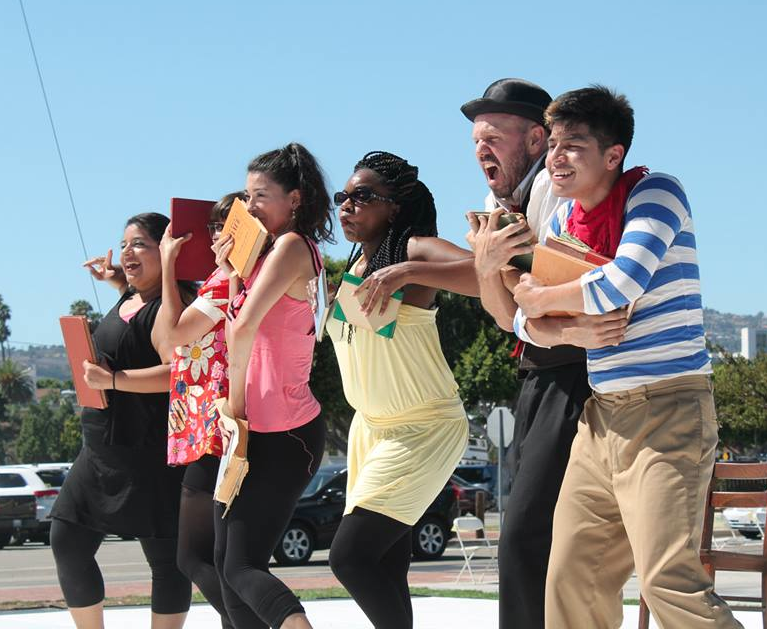 Reichlin hosted and organized six hours of diverse dance over the course of the weekend, providing an opportunity for many Los Angeles based companies to share their work. 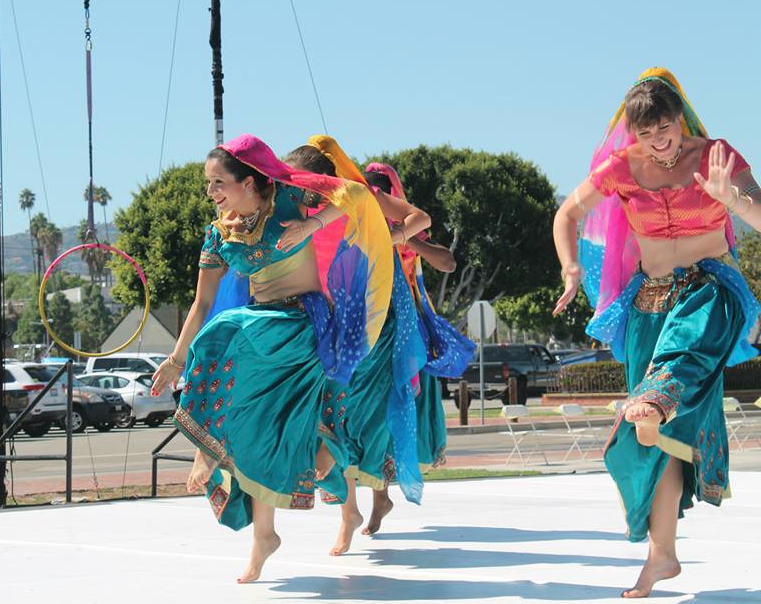 From Bollywood to dance theater, dancers of all generations took the outdoor stage to share their love of dance. I attended the festival on Sunday September 21, staying for two hours of the event and enjoying six different dance groups. My day started with Jrick and the Hot Flashers, a group of 50+ year old performers who love getting down to lively pop music in a hip hop and funk frenzy. I enjoyed the dancers’ passion and community as they shared their love of dance and their ability to get down with their fearless leader- who just celebrated his 70th birthday! manGo Dance Theater took the stage next, exposing the audience to the opposite end of the dance spectrum, with a whimsical community based dance theater performance based on themes of literacy and learning, called Others follow…Dreaming. The dancers entered the stage in a combination of striped shirts, bowler hats, and lively expressions. Directed by Diana Cummins, this performance group runs on a mission to foster creativity and expression, and this piece represented their values clearly, as the dancers performed a combination of dance movement and clown-like pantomime with personal conviction and commitment that was authentic and joyous. This group was not about pristine unison or virtuosic dance technique, but the joy of creativity and movement’s ability to transform. The rhythms of India followed with MKM Bollystars. This group blended traditional Indian dance with Bollywood performance energy for an upbeat stage full of colorful saris and smiling faces. The artistic director performed a Classical solo, while the ensemble of young women performed a few different selections including a crowd pleasing piece set to the movie favorite Jai Ho. The host company Louise Reichlin & Dancers took the stage premiering new works by the company. The first piece, Several Self-Gestapos… a siren-song from the afterlife was conceived by Linda J. Albertano. It told the story of four messages coming to someone upon death. The four sections included a ballerina clown, flamenco dancing devils, an angel in the form of Marlilyn Monroe with a poet partner, and a Bedouin reaper. The aesthetics of the four sections stemmed from distinct movement vocabularies and changes in musical accompaniment. The program and Reichlin’s description of the work were helpful in linking them together. The second work, entitled Invasion, had some structural similarities to the first work, with sections of the work stylistically separated by distinct musical changes and movement vocabulary. This work functioned on the idea of accumulation. The premise of the work addresses a futuristic society coping with an invasion of another species. With each section, a new movement idea was introduced (as well as a new costume color) that then became assimilated into the larger whole of the ensemble. It was a provocative and complex idea, and again I found the program notes much appreciated. The challenge of this work was its overall arc. The choppiness of the sections and changes in music affected my ability to follow the overall arc of the piece leading up to the culminating section in which everyone danced together, with fused styles and mixed up costume pieces. Nevertheless, the message of the work was successfully conveyed to me, and I very much appreciated the choice to address the big questions of life, identity and cultural assimilation through a dance abstraction. Hiroshi Hamanishi is a well-known tap dance name in the LA area, and I was pleased to see him on the line up! He shared his love of rhythm with a few of his friends in this tribute to LA’s own tap master Bob Carroll (he recommended we all look this man up and even took the time to spell Carroll’s name to make sure we found him—which I did). The joys of the tap rhythms were contagious and while the marley floor (so appreciated by the majority of the dance groups) wasn’t ideal for the tap dance choreography, the microphone set up to catch the tap sound made a huge difference for these tap performers. The final group I saw was Rebecca Green Moves. This quartet of contemporary modern dancers was endearing in their performance of a quirky piece based on connecting and disconnecting. Their intentionally mismatched outfits added to the fun-loving energy of the work. These dancers are clearly well trained contemporary in modern dance with a strong leaning toward the liquid gaga style and release technique. And, while this more abstract style of dance can sometimes be inaccessible to a mixed audience, Green managed to balance the technique of the work with a human component of play between the dancers, which kept the audience engaged emotionally as well as impressed with the dancers’ physicality. This event reminded me of the important of dance as a community-supporting activity. Often we see dance that is produced for a concert environment where it can sometimes feel like an insiders gig, a dance show produced for dancers. This event was about sharing the diversity of dance in an open and supportive environment for all people—free! The gift of this event is something everyone should flock to for both the entertainment value and the artistic exposure. 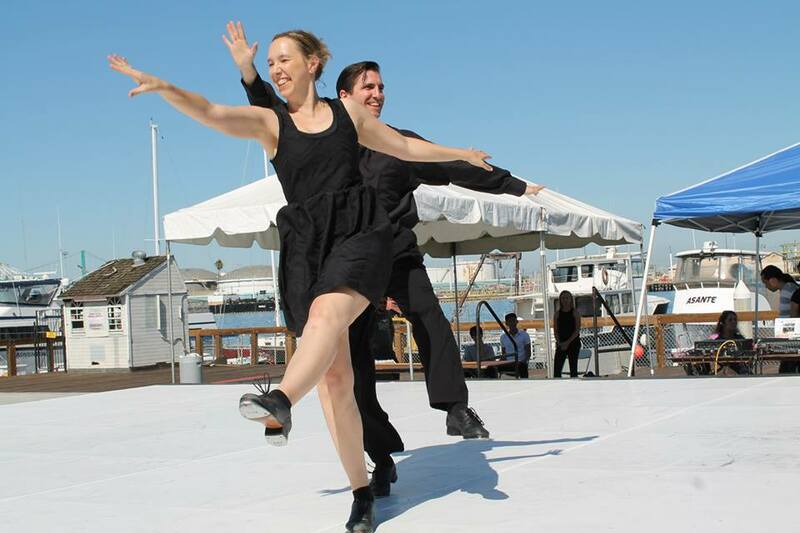 Great for kids and adult alike, next year, I highly recommend making a day outing of to the beautiful harbor for a day of dance in the sun. But, remember to bring LOTS of water and a sunscreen to combat the late summer rays! ← Breaking the glass ceiling one female choreographer at a time!